We’d love your help. 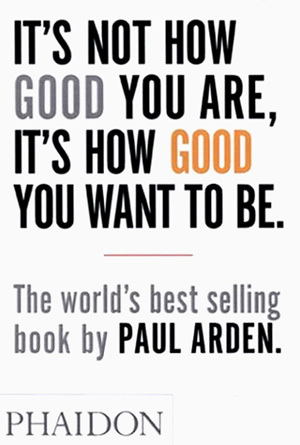 Let us know what’s wrong with this preview of It's Not How Good You Are, It's How Good You Want To Be by Paul Arden. It’s Not How Good You Are, It’s How Good You Want to Be is a handbook of how to succeed in the world: a pocket bible for the talented and timid alike to help make the unthinkable thinkable and the impossible possible. The world’s top advertising guru, Paul Arden, offers up his wisdom on issues as diverse as problem solving, responding to a brief, communicating, playing your It’s Not How Good You Are, It’s How Good You Want to Be is a handbook of how to succeed in the world: a pocket bible for the talented and timid alike to help make the unthinkable thinkable and the impossible possible. The world’s top advertising guru, Paul Arden, offers up his wisdom on issues as diverse as problem solving, responding to a brief, communicating, playing your cards right, making mistakes, and creativity – all endeavors that can be applied to aspects of modern life. To ask other readers questions about It's Not How Good You Are, It's How Good You Want To Be, please sign up. Can anyone help me to download this book fo free?.. Menami Hello Emilia. The book is available on Scribd and you can read it for free. My brother recommended this book because I was looking for a good self-help book. I wanted something to motivate me. This book is not about motivating the reader in general, but rather its focus is on the business side of life. I read this without reading the summary at the back, or even reviews of people here on goodreads. I wanted to read it because of the title. I had no idea it is about business, if I had prior knowledge about the book, I wouldn't have read it. It's not that I'm not intereste My brother recommended this book because I was looking for a good self-help book. I wanted something to motivate me. This book is not about motivating the reader in general, but rather its focus is on the business side of life. It's not that I'm not interested in business, but as a current pre-med student, it honestly doesn't relate to my life. As much as I want to establish in my mind that it can be self-help in general, it just can't. My interest in medicine is in the operational side. I want to be a surgeon, so how can a business book help me in that dream? هذا الكتاب مرجع رآئع للأشخاص الذين يطمحون إلى بلوغ أعلى المناصب ..
بالفعل كتاب يستحق القرآءه مره و مرتين و أكثر ..
أنصح بهِ ك هذا الكتاب مرجع رآئع للأشخاص الذين يطمحون إلى بلوغ أعلى المناصب ..
Just another book I read during one of those sunday sessions at my brother's house. Honestly, I didn't enjoy it more than I did with Whatever You Think, Think The Opposite. The main idea of the book is the same, which is to do things the unconventional way and how it would lead you to achieving something greater than you thought you could. Frankly, I am sick of these 'advices'. Don't be afraid to make mistakes (yes, acceptable), mistakes is okay (OK, but not so much), NOT GETTING GOOD GRADES IN Just another book I read during one of those sunday sessions at my brother's house. Honestly, I didn't enjoy it more than I did with Whatever You Think, Think The Opposite. The main idea of the book is the same, which is to do things the unconventional way and how it would lead you to achieving something greater than you thought you could. Frankly, I am sick of these 'advices'. Don't be afraid to make mistakes (yes, acceptable), mistakes is okay (OK, but not so much), NOT GETTING GOOD GRADES IN SCHOOL IS FINE (seriously?). The part where it says that people who did well in school might not be successful later in life attacked me personally. I believe that when you did well in school, it's because you have the right attitude, and when you have the same right attitude in your career, everything will go just as fine, I'm sure. Besides, it makes me scared and worried that if I do well in school, that's just that and I can't make it big in life. Totally the opposite of what inspirational book should do to its readers. One part I think made sense though, it's not to be afraid to share the knowledge that you have to others, as it will motivate you to do more as to keep up with the others, and eventually results in you being a better person than you already are right now. That's the only inspiration in this inspirational book. Before you read this, ask yourself, Why do you want to be good? Because Arden is incapable of answering it. Unless you figure it out, you're more miserable than the failures he describes in this book. If you’re thinking that you will get something new, totally revolutionary, and out of the box, you will be very disappointed. The advise and ideas in the book are very widely known, things you already do, and in most cases, the author keeps repeating himself. However, its really sweet, easy read, and provides a great positive reenforcement to you, and assures you that you will get your desired success. I recomend this book to anyone from fresh grads to seasoned executives. 1- “Do not seek praise. Seek criticism.” - I myself fall victim to this mindset often. Generally for a lot of things we do our ego and self-image is attached to it so we never really bother to seek out criticism from others. And the truth is the only way to keep improving yourself and what you do is to be open minded and actively ask those around you what you can make better. 2 - “The person who doesn't make mistakes is unlikely to make anything.” - Getting ahead in your niche usually involves taking risks, we stay in our comfort zones for fear of making a big mistake. Funny thing is if you look back and reflecting on your life and the major decisions you've made, it's clear that almost all progress you made has been a direct result of mistakes you made along the way and detours you took to get back on track. This, at first glance, is a rather mysterious book. From its title, you might think it was a motivational tract for athletes or performing artists, or possibly a training manual for aspirants to sainthood. It claims to be ‘the world’s best-selling book’, yet this is an obvious lie. Most mysterious of all, it is published by Phaidon, a house specializing in pricey coffee-table picture-books, yet it is a paperback, no larger than the average newsstand bestseller, and the few pictures it contains a This, at first glance, is a rather mysterious book. From its title, you might think it was a motivational tract for athletes or performing artists, or possibly a training manual for aspirants to sainthood. It claims to be ‘the world’s best-selling book’, yet this is an obvious lie. Most mysterious of all, it is published by Phaidon, a house specializing in pricey coffee-table picture-books, yet it is a paperback, no larger than the average newsstand bestseller, and the few pictures it contains are aesthetically unremarkable. How did the world’s most pretentious publisher, which advertises itself as the ‘Home of the Visual Arts’, ever come to publish this strange little trifle? The mystery is solved by looking up the author’s name. You may never have heard of Paul Arden, but if you are old enough, you are probably familiar with some of his work, which appeared in the media all around the world during the 1980s. Arden was a legendarily successful advertising man, a name to conjure with in London media circles during the Thatcher era. Readers knowledgeable about the dark arts of advertising will remember the 1980s as an unusually creative period, a time when London was the pulsing centre of the ad world, Madison Avenue took second place in the creativity stakes and the shackles of twenty-first-century consumer capitalism were forged in a mad rush of champagne, single-malt whisky and cocaine. The hottest London shop in those days was Saatchi & Saatchi, and that is where Arden made his reputation between 1977 and 1992. According to one source, he was ‘the ringmaster behind the creative circus that saw British Airways become the world’s favourite airline, the Independent become the new intelligentsia’s favourite newspaper, Margaret Thatcher the nation’s favourite leader and Silk Cut their favourite fag.’ By some lights, then, Arden has a great deal to answer for; but since he died in 2008, we can leave his punishment in the hands of higher authority. What of It’s Not How Good You Are, It’s How Good You Want to Be? Well, it certainly isn’t the world’s best-selling book. It’s the world’s best-selling book by Paul Arden, who as far as I was able to find out has written only two others. In other words, it is a typical advertiser’s claim: literally true, but failing to deliver any of the quality or value you have a right to expect from it. Once you’ve deciphered its real meaning, you have only yourself to blame if you go on to open the book and read what’s inside. You have been given fair warning that the contents are morally revolting. They are also, for the best part, of no practical use whatsoever. Arden appears to have thought that creativity is valuable in its own right – a debatable proposition to say the least. He also treats novelty as equivalent to creativity. This was the cardinal error to which British advertising of his period was prone. Finally, he appears to have believed that creativity consists of doing the opposite of what is expected. And that, for the most part, is what his advice in this book boils down to. Chapter titles include the following: ‘It’s wrong to be right.’ ‘It’s right to be wrong.’ ‘When it can’t be done, do it.’ ‘Do not seek praise, seek criticism.’ Reading the actual ‘chapters’ that appear under these attention-grabbing headlines disappoints in exactly the same way that an over-touted product or service disappoints; they bear out their titles in a literal way, but the advice they contain is the same tired, warmed-over stuff served up at industry ‘creative workshops’ all over the world. Some of the suggestions – compose your ad from the weakest point, sell your ideas using rough scribbles, not finished layouts, share your ideas (and the credit for them) with others, don’t be afraid of looking silly or making mistakes – are valid. They will also be well known to most of his readers, thanks to those creative workshops, though few will be brave enough to act on them. Other suggestions appear less valuable, or even downright bizarre – ‘if you get stuck, draw with a different pen’ or ‘always schedule new business pitches for Tuesdays.’ Every creative person has his or her own set of muse-invoking rituals; Mr Arden appears to have thought that his were universally applicable. Such is the arrogance bred by great success. I have already written more than I want to about this very bad book, but unfortunately there is one more point to be addressed before I stop. According to the introduction on the jacket flap (yes, it’s so pretentious it has a jacket flap, even though it is a jacketless paperback), ‘this book uses the creative processes of good advertising as a metaphor for business practice.’ In other words, it’s more than a how-to book for agency creative staff: it’s a management manual. Well, hell no, it isn’t. Advertising is a very small part of entrepreneurship, and what works to sell products and services via the mass media doesn't necessarily work so well online, in the executive suite or on the factory floor. Any manager who tried to run his business or his department along the lines proposed by Arden – constantly chopping and changing how things are done, giving people something new and unexpected to cope with every day, recklessly ignoring the possibilities of failure or error – would soon be ruined, and probably end up in gaol or a psychiatric ward into the bargain. In fact, many ad agencies, most notably the briefly celebrated American shop Chiat/Day, have gone bust doing precisely this. Because, you see, Paul Arden was deeply, fundamentally, pathetically wrong. However much you may want it to be about how good you want to be, in the end it really is about how good you are. People don’t want to face this fact, but there it is. It just so happens that talent and capability are much rarer than ambition. And if you have no talent, what you create will always be malformed and worthless – except, of course, in cash. Paul Arden and his ilk are responsible for much of what is cheap, vulgar, valueless and dishonest about today’s world, and in particular with media-driven consumer capitalism. They were a despicable crew, and we are not rid of them yet. His colleagues Maurice Saatchi, Tim Bell and Martin Sorrell now sit in the British House of Lords, while his former boss was for some years the most important tastemaker in the rarefied world of the fine arts. Remember the HIV-positive blood sculpture that melted in Nigella Lawson’s freezer? That is what the arts came to under the patronage of Charles Saatchi. If these people did not make the world we live in today, they are at least responsible for many of the nastier aspects of it. It is high time we were rid of them and their cynical, moneygrubbing values. لا أحبذ كتب التحفيز و والتنمية البشرية.. لكن بتوصية من صديق، و جملة " الكتاب الأكثر مبيعا في العالم " على الغلاف ، اقتنيته . أيضا حديثه في مجال ادارة الأعمال و الشركات كموظف يريد أن يرتقي و لو على ظهور غيره و لو بالخديعة.. أين الجانب الأخلاقي؟! * المجازفة معيار للبشر. أولئك الذين لا يخاطرون يحاولون الحفاظ على ما يمتلكونه .أما الذين يخاطرون فغالبا ما ينتهي بهم الأمر إلى امتلاك المزيد. الكتاب خفيف, به نصائح لطيفة سواء في مجال التنمية والتطوير أو الأعمال بشكل عام, كما أن به بعض الأفكار الجميلة والعملية المحفزة, لغته سهلة ومناسبة لمن مستواه متوسط أو جيد في اللغة الإنجليزية, وهذه حسنته معي للأمانة, فهو يفي بغرضين: كونه قريب من مجال دراستي وعملي (وهنا لم يضف لي الكثير), والثاني في التصالح مع الكتب الإنجليزية (فهو أول كتاب أقرأه كاملاً بلغته). الكتاب بتوصية واستعارة من الجميلة والرفيقة ندى, و لأني قرأته تحت تهديدها وبرفقة نقاشاتها (والسؤال عنه في كل لقاء), لذا يمكن اعتباره أول كتاب الكتاب خفيف, به نصائح لطيفة سواء في مجال التنمية والتطوير أو الأعمال بشكل عام, كما أن به بعض الأفكار الجميلة والعملية المحفزة, لغته سهلة ومناسبة لمن مستواه متوسط أو جيد في اللغة الإنجليزية, وهذه حسنته معي للأمانة, فهو يفي بغرضين: كونه قريب من مجال دراستي وعملي (وهنا لم يضف لي الكثير), والثاني في التصالح مع الكتب الإنجليزية (فهو أول كتاب أقرأه كاملاً بلغته). A slender volume and a quick read, exactly what you need to catch up on your reading goals. The typography, layout, and artwork are exquisite, and the subject matter utilizes novel examples and metaphors to get you fired up about excelling in your work. If your work involves creativity, this book will inspire you to push your limits and communicate your ideas at the right level to your clients. It's a lot of fun. Ce livre résume absolument tout ce que je déteste : comment vendre, comment faire du marketing, comment enrober de belles promesses, se faire du réseau...Bref, je ne suis pas la bonne cible et j’en suis ravie ! Nicely designed book with some interesting ideas. Super quick read and worth the 30 mins you'll spend with it. It's written by the late, ad guy Paul Arden, but a lot of his advice can be applied more generally to anyone doing creative work. Equal parts tacky and great. الكتاب خفيف جداا شكله حلوو اوراقه مرتبه وجميله ،، لا يختلف كثيرا عن كتب تطوير الذات نصائح نصائح ولكن المميز انه بعيد جدا عن الحشوو هذا احلى شي توصل الفكره بصفحه او صفحتين .. والصدق كل عنوان رئيسي تلخص في جمله من كل صفحه يعني لو انحذف كل الكلام وبقت هالجمله مابيأثر على المعنى وبتوصل الفكره .. استفدت يمكن من نصيحتين بس بطبقها في عملي ان شاء الله ..
بشكل عام الكتاب جيدا جدا للناس اللي يعشقون الكتب الخفيفه جدا ويبحثون عن نصائح تطوير الاعمال ..
بشكل خاص بيستفيد منه كثيرا الناس اللي يعملون في مجال الاع الكتاب خفيف جداا شكله حلوو اوراقه مرتبه وجميله ،، لا يختلف كثيرا عن كتب تطوير الذات نصائح نصائح ولكن المميز انه بعيد جدا عن الحشوو هذا احلى شي توصل الفكره بصفحه او صفحتين .. والصدق كل عنوان رئيسي تلخص في جمله من كل صفحه يعني لو انحذف كل الكلام وبقت هالجمله مابيأثر على المعنى وبتوصل الفكره .. استفدت يمكن من نصيحتين بس بطبقها في عملي ان شاء الله ..
بشكل خاص بيستفيد منه كثيرا الناس اللي يعملون في مجال الاعلانات وبشكل عام للناس اللي يبحثون ان يحققون طموحات كبيره في مجال الاعمال ..
همسه صراحه ::: اللي حاب انه يقرأ الكتاب يحمله الكترونيا .. لانه سعره غالي مقابل الاستفاده اللي يقدمها ^_* .. فيه كتب تطوير ذات افضل تستحق انه ندفع من اجلها ..
بعض كتب تطوير الذات . If you want inspiration this book will give it to you, not because it's full of Aha moments or well articulated advice but because it's been written so poorly you wonder how it even made it to the printing press, which means even YOU could write a better book and get it published. If there's one thing you can take away from it, it's the value of having a good cover title and name, the rest is just hyperbole and generic advice. It's a predictable and horribly unoriginal book preaching a If you want inspiration this book will give it to you, not because it's full of Aha moments or well articulated advice but because it's been written so poorly you wonder how it even made it to the printing press, which means even YOU could write a better book and get it published. It's a predictable and horribly unoriginal book preaching about doing unconventional things to be exceptional. Livro motivacional para que sejamos melhores profissionais. É um livro um pouco mais voltado para a publicidade, as partes em que faz referência a isso foi as que menos adorei. Toda o livro nos motiva a sermos melhores, a errar, a não complicar, porque só assim se pode ter boas ideias e a torná-las sucesso. Curto mas poderoso, para se ter na cabeceira e ler sempre que precisaremos de um UP na nossa vida profissional e pessoal também, basta saber adaptar. « يعتبر الناس صناعة الإعلانات عنملاً كريهاً نوعاً ما. أنا لستُ كريهاً أكثر أو أقل منكم. نعم بالطبع أنا أبيع.لكنكم جميعاً تفعلون ذلك. أنتم تحتالون أو تبيعون أو تحاولون أن تدفعوا الناس لشراء شيء ما؛ خدماتكم أو وجهات نظركم. راهبك أيضاً يبيعك إنه يبيع إلهه..الفكرة هي أننا كلنا نبيع. Recommends it for: Someone who is creative and thoughtful! Paul Arden is a fantastic speaker; he clearly knows what he s talking about when it comes to being successful. There are lots of uplifting tips and you can dip into the book easily or read it from cover to cover. It’s a short book but compact with useful information. It’s one of the best ‘Self Help’ books I’ve ever read! أفكار مستهلكة تتحدث عن الإبداع. Aku tahu buku ini akan berguna. Akan kubaca lagi bila butuh suntikan semangat tentang kreativitas dan potensi diri. Sebenarnya, lebih cocok bagi orang-orang yang bekerja di digital agency. Paul Arden (7 April 1940 – 2 April 2008) was an influential author of several books on advertising and motivation including "Whatever You Think, Think The Opposite" and "It's Not How Good You Are, It's How Good You Want To Be" and a former creative director for Saatchi and Saatchi at the height of their advertising might. In 1987 Arden was appointed executive creative director. He has spent 14 year Paul Arden (7 April 1940 – 2 April 2008) was an influential author of several books on advertising and motivation including "Whatever You Think, Think The Opposite" and "It's Not How Good You Are, It's How Good You Want To Be" and a former creative director for Saatchi and Saatchi at the height of their advertising might. In 1987 Arden was appointed executive creative director. He has spent 14 years with the agency, handling accounts of British Airways, Anchor Butter, Toyota, Ryvita, Nivea, Trust House Forte, Alexon Group and Fuji among others. His British Airways campaigns continue to be remembered as one of the greatest advertising campaigns of all time, changing the fortunes of the airline.